Fujitsu Limited and Fujitsu Kyushu Systems Limited (collectively "Fujitsu") today announced the establishment of a new company in Finland, Fujitsu Greenhouse Technology Finland Oy, to operate a plant factory equipped with an agricultural Information and Communication Technology (ICT) system, and to produce and sell agricultural products. The new company, jointly financed by Robbe's Little Garden Ltd. , commenced operations on November 17. Fujitsu Greenhouse Technology Finland, which will begin full-scale production in the first half of fiscal 2017, uses a plant factory equipped with the latest technologies, including the FUJITSU Intelligent Society Solution "Akisai" Food and Agriculture Cloud, which is Fujitsu's food and agricultural cloud service, along with fully artificial lighting using LEDs, multi-tier growing trays, and full automation. 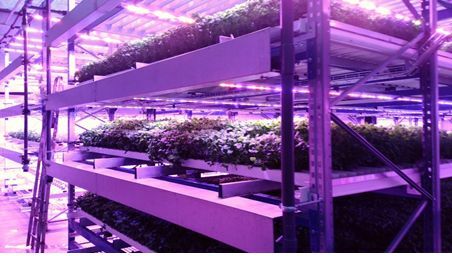 Fujitsu and Robbe's Little Garden aim to grow and deliver a steady, year-round supply of vegetables, such as baby greens and leaf lettuce, in Finland, which has few hours of sunlight during its harsh winter. Fujitsu also aims to package the know-how and cloud services resulting from this business and deploy them throughout the European Union. To supply fresh produce to consumers it is important that it be produced nearby to where it will be consumed. In northern regions, however, the short days and weak sunlight of winter make it a challenge to grow anything during that part of the year. Finland has supported plant-factory operations that are able to grow produce without being affected by the country's typical northern climate, but it has not been able to deliver a quantity of produce that satisfies the country's demand, leaving it partly dependent on imports. Leafy vegetables, in particular, are mostly grown in southern Europe and imported to northern regions, resulting in a longer delay between harvesting and delivery to consumers, diminishing freshness. To grow and supply agricultural products in Finland year round, Fujitsu and Fujitsu Kyushu Systems jointly invested with Robbe's Little Garden to establish a new company, Fujitsu Greenhouse Technology Finland, which will use a plant factory to grow and sell agricultural products in Finland. Along with the three principals that invested, the Trade Section of the Embassy of Finland in Japan worked to coordinate the establishment of the business. Fujitsu Greenhouse Technology Finland integrates Greenhouse Horticulture SaaS , a cloud service for greenhouse operations based on Akisai, together with sensor information collection utilizing the Ubiquitous Environment Control System , hardware which controls greenhouse equipment, as well as the production techniques of Robbe's Little Garden. The growing environment is lit exclusively by artificial light using LEDs, and the plant factory is fully automated to rotate multi-tiered growing trays for efficient plant growth and to control air conditioning. Focusing on leafy vegetables, such as baby greens and leaf lettuce, the business will begin full operations in the first half of fiscal 2017, and will begin shipping produce during 2017, reaching the Finnish market through the sales network of Robbe's Little Garden. Fujitsu also aims to package the combination of Greenhouse Horticulture SaaS and production equipment, including multi-tier growing trays, sensors, and LEDs, for deployment throughout the EU. Cumulatively JPY 3 billion by fiscal 2020. A company that uses greenhouse cultivation in Finland to grow and sell agricultural products. It has sales of approximately €2.5 million and around 20 employees. A cloud service that uses data gathered by sensors to visualize the production process, remotely monitor greenhouses, and remotely control equipment. Japan’s dominant communications standard for greenhouse cultivation. An information platform that allows interconnection of all the various environmental monitoring and control devices in a greenhouse, and that implements autonomous, distributed, and cooperative “smart” ICT environmental monitoring and control.